Food Blogga: It's a Food Blogga Give-Away for See's Candies! It's a Food Blogga Give-Away for See's Candies! Looking for a delicious Easter gift this year? Forget the Peeps and the jelly beans. Give the gift of See's Easter candy instead. There's an adorable and tasty treat for everyone on your bunny list including classic foiled wrapped chocolate bunnies, springtime truffles, bunny lollipops, and my personal favorite, peanut butter filled chocolate eggs. See's Easter gift boxes come wrapped in festive Easter egg paper. 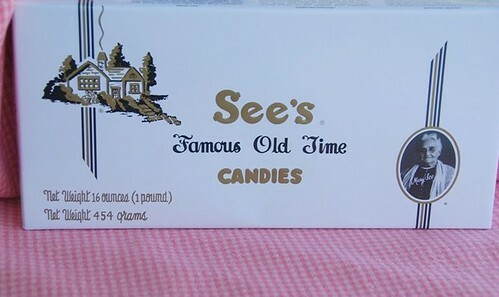 See's Famous Old Time Candies® was founded in California in 1921. See's is beloved throughout the western US, and especially in California, which is dotted with scores of their charming candy shops. Enter any shop, and feel like you're stepping back in time. The impossibly polite staff are dressed in pristine old-fashioned black and white uniforms that evoke a warm sense of nostalgia. Dozens of delectable See's candies are displayed in cases like jewels, and myriad beautifully wrapped gift boxes are there for your choosing. Plus the best part of the experience, as See's devotees know, is receiving your complimentary piece of See's candy after you make your purchase. What makes See's Candies so scrumptious? According to the company, "to produce the best possible boxed chocolates, we at See's acquire the choicest and finest grade raw ingredients from all over the world. Making over 100 varieties of candies, we have maintained our reputation for excellence by strict adherence to See's 'Quality Without Compromise®' motto." I can attest that their chocolate is among the finest available, as I have been savoring them my entire life. The first time I went to a See's candy shop, I was about 10 years old. I was so smitten, that I thought, Forget being a doctor or a lawyer when I grow up. I want to work in a See's candy shop. Well, that didn't pan out, but living in California is the next best thing. And since you can order See's candies online, you can enjoy them no matter where you live. Some of my favorite See's candies pictured above include walnut squares (dark chocolate and caramel with English walnuts), Kona mocha (coffee and chocolate buttercream topped with toasted coconut), and Scotchmallows (honey marshmallow and caramel dipped in dark chocolate). Just tell me why you'd like to win the See's Candies gift certificate. Please respond by the end of the day, Monday, March 23, 2009. That's it. With the help of random.org, 1 winner will be randomly selected and announced in a future post, so please check back. The give-away is open to all Food Blogga readers wherever you live. The winner will need to provide her or his real name and mailing address. Don't have a blog? Just leave an active email address where you can be reached. Good luck, everybody! I have never ever had See's ,I want to try them! and I LOVE chocolate ... oh and My birthday is the 23rd! What a great surprise that would be! I am obsessed with See's. I live in SF and have 2 near where I work that I alternate between. The peanut crunch and almond nougat are my favs...thanks for the contest! I love See's candies! My grandma would buy us chocolate eggs with our names written on top every year when I was little. Since she has passed away I have missed finding them in my easter basket! I am obsessed with See's! But, alas I live all the way in NYC, and it is snowing here on the first day of spring. See's would definitely uplift my mood. Reminds me of my childhood. Great giveaway, btw. I saw them in the tvfood network. Its a cool giveaway... I hope I win! They were my Granny's favorite (hands down and that woman KNEW candy) and my mom has acquired a love for them as well. I'd love to send my mom down in GA her own box for a little Easter surprise! I've seen them in Branson and have never tried them... great giveaway. I love discovering hidden treasures...plus, you can never go wrong with chocolate! I'd love to win! Thanks for sharing! Oh my gosh I havent had See's candy in years!! YUMM! If I would win I think I would have a pretty hard time deciding what to get with it! Thanks for the chance! I've never tried See's Candies - heard many good things about them, but haven't gotten around to ordering them. Would definitely like to try! Yum! I'd love to win, cause I love chocolate! I've never had See's, but I've heard it's great. I've only had See's candy once when my brother sent me some from CA. They were devine. I would absolutely love to enjoy another box of these. To allow the aromatic and luscious candies melt in my mouth for as long as I can!! They are THE most delicious chocolate candies I've ever tasted. I've not seen this candy before, but would love to win, because I'm a chocoholic who appreciates really good chocolate! I'd love to win because they are YUMMY! I used to live in S.F. and it seems that everyone there loves them, and that's where I fell in love too. Nice giveaway! I want to win because i love See's candy. At my old job, we had a customer from CA and they would send me a boc every Christmas. Love it. Uhm....I'd like to win to try out every piece!! My birthday is in March so this would be a perfect treat! I was going to impress you by naming off all the chocolates in the picture, but you already did that, so I remember the first type of See's Candy I ever had: Milk Bordeaux. Yum! I haven't had these since I was in LA 2 years ago. I'd love to win some for Easter! As an east coast girl, we only get See's candy when they open a special storefront at Christmas time. I need a fix! Because I've never had a scotchmallow before, and I've heard that See's caramel-marshmallow- chocolate concoction is the best! We didn't even know what See's was until we moved to LA! But it's really good stuff. Hi...I would love to win the See's candy to send to my cousing, Susan, who has MS and See's candies were the only thing she wanted for Christmas this year...she got them! Becky at kyladog1_1999@yahoo.com Thank you! I love your site! Keep it coming! mmm.....See's candies..... I'd like to win them so I can share them with my fiance who has an insatiable sweet tooth. This will certainly help take the edge off of a long work week. Oh, how I remember See's. I grew up in California also, and I always remember looking in the store longingly whenever we went to the mall. A box of See's was a huge treat at our house. Do they still make the chocolate covered toffee wafers? See's Chocolate is sooo Delicious! It is Velvety smooth out of this world delicious!! Who would not want to win this decadent delight!!!??? A $25 to See's OMGosh that is a Gift of Sheer indulgence!!! Oh and by the way, I would so share with my whole family! smile! See's candies were the first chocolates my husband and I shared after we became an item. We don't buy them for ourselves at all but every time we pass a store we look at each other with twinkles in our eyes. I have had a few See's chocolates before, and they are DELICIOUS! Would love to win. I gave up chocolate for lent. So clearly, I would be head over heels for this! oh my gosh! those look so good. i would like to win because i'm a chocolate fiend that cannot live without it!! Let me tell you why I would like to win the See's Candies! I'd like to win on the 23rd so I can give this present to this lady at work who live for chocolates. She calls them breakfast of champions and her birthday is on the 24th of March. It would be a very nice surpise. Plus, don't forget that See's not only have the best Nuts and Chew selections, they also have the melt-in-your mouth peanut brittle. You can't stop at just one!! That's why, I would like to win. I'll share. For a dark chocolate high & then to hop like a mad Easter bunny Susan!! I love the answer above me-so cute! I love See's candies, I used to live right down the street from one. Sadly I'm on the east coast where we don't have the convenience of walking into one on whim or to satisfy a craving. 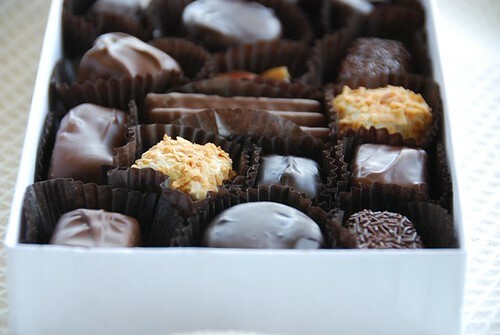 I would love to have some See's candies- it brings back great memories. I would love to share these delicious treats with my hard working classmates. No sleep til I get my Master's degree! I'd like to win so I can eat the chocolate! I'd love to win because I've never tried See's, but have heard wonderful things about them! He told me how amazing they were. I recently won 2 box of my choice elsewhere. I chose the no-sugar dark chocolate almond and walnuts. I can vouch for their deliciousness. I've been savoring every biteful! The winner is in for a treat! Living in upstate NY, I have to order See's for myself now, but there was a time, living in SF, when I could walk to the nearest See's shop and choose milk chocolate vanilla creams whenever I wanted. See's puhlease! Because I have never won anything. LOL I just wanted to post something different. I haven't had them either, but have heard plenty about them... we have Peterbrook Chocolate here... lots of mmmmmers there! I'm convinced that every office in California have their own specific rules regarding Sees candies. Most of my group like, no love, the same kind (bordeaux) and they have all these very polite rules regarding who gets to pick first and such. Lucky me, I'm into the nut chews lately figuring there is enough protein in there to count them as a snack and not a candy. Clever! If I'm the lucky duck in this contest, that custom box will contain plenty of the candies so adored by my partners in crime, um, co-workers. There are so many varities to choose from. I love anything dark chocolate. I would love to win. Why, I've never had See's chocolates before. I've heard of them, but never tried them. I usually enjoy the Godiva. I'm curious to which one I like better. I always got Sees candy to put in my daughter's Easter basket, even if it was only one bunny. Now I am on Social Security and cannot afford to get any Sees for her or my grandchildren. I would love to be able to do that this year. My close friend and I used to share moments eating See's in her sunny, yellow kitchen. I have fond memories of those moments. Now she just had her first child, and I'm going to visit for a while. It would be a great thing to start our celebration and catching-up. Take care. Thanks for the opportunity. Help! I've fallen and I can't reach my chocolate! Several years ago Sees has a christmas cart at the mall and I had the pleasure to try these tasty treats and they were fabulous!! My daughters birthday is on Easter Sunday this year and I would love to put a box in her basket to enjoy ! I would love to win a See's Candies gift certificate because I have heard that they are delicious and I would like to try them. Because I have finally discovered good chocolate, which means fighting off my chocolate fanatical children over Easter. 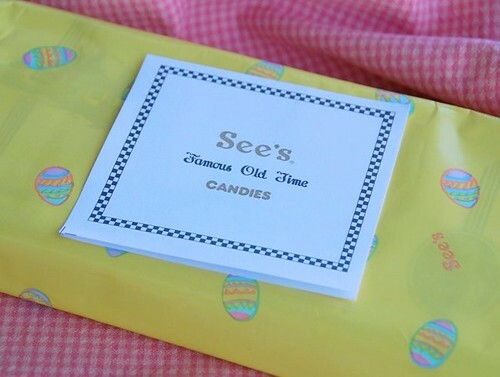 See's Candies were the ones that we gave out as favors at our wedding, I would love to have some for Easter! I would love to win this gift certificate for See's candies! As you suggested, I would use it to order a custom mix to perfectly match our specific sweet tooth - or maybe that should be sweet teeth! LOL! I would save it for dessert the next time our extended family gets together. What a sweet treat! Thanks for the opportunity to win! I would love to win this gift certificate because the sound of candies like Kona mocha makes my mouth water! Oops! Just left the previous comment - my e-mail is emlawton13@yahoo.com. Sorry! I'd love to win the See's Candies GC because I love chocolate, but consider it a luxury so I don't buy it often. I NEED this gift certificate! Just seeing these candies have left me with a bad case of drooling lip disease and See's Candies are the only thing that can cure this! ooooooh I would sooo love to with this! I saw a show on See's candies once and boy did everything look scrumtious! I would like to win the See's gift certificate because I have a terrible sweet tooth and I love chocolates!! It's been years since I bought See's. I'd love to get reaquainted! I have only heard about See's candy, have never seen it or tried it before. Thanks for the chance. Why? because I absolutely LOVE chocolate and sees is the best! I would love to put these out on Easter to share with our guests. Pick me, pick me! I grew up in So Cal and am now living in Maryland. I need my cashew Brittle, California Brittle and Scotchmallow fix....bad! As a child I lived very close to the Mall in Redondo beach that had a See's Candy shop. Oh what memories! My sisters and I always had a decorated See's Easter egg in our basket. Another memory is the free sample while my Mom was buying her chocolates. See's are the best chocolates! Because I never had SEES and I'd like to try the Dark Peanuts Roasted, salted peanuts. I would very much like to tin the SEE's gift certificate since I have heard a lot about this company, yet have never, ever seen it nor have I tried it. A California friend of mine brought me a little canister of some of their amazing candies as a thank you for a couple of nights of space on my couch. They were amazing, and I'd love to try more!! I'd love to win a box of See's candy because it looks fabulous!! I love trying different chocolate and since they have been in business since 1921 they must be doing something right! I just heard about See's Candies today while blogsurfing. It all had to do with evil dragons torching little Peep bunnies. Hopefully there are easier ways to obtain chocolate!. Please count me into the drawing. We'd love to win a box of See's chocolates! I'd like to be able to share these chocolates with my family when I come home from college for break! Chocolate covered peanut brittle candy bars. I would like to win these candies so that I can give them to my mom for her birthday, which is mrch 23rd! what is this new adventurous treat you mention, chocolate? is that it? I read, somewhere, that chocolate was a bean, a vegetable. The picture and your description does not match any vegetable for which I am aware. Oh....See's.....so many memories....I can remember going into the shopping mall as a child and getting the suckers....yum! On my recent trip out I had planned to get a box of chocolates at a See's shop and ended up too busy with family....but low and behold when I was at the airport about to board and head back to SC...they have a shop in the airport...I was able to bring back little pops for all the peeps at work. I would so love to win this. Thanks for the opportunty. I would love to win some See's chocolate. It's so delicious. Nuts and chews, nuts and chews, nuts and chews...heaven! I'm an LA girl, now in the Midwest, missing my See's! Chocolate and I get along famously! 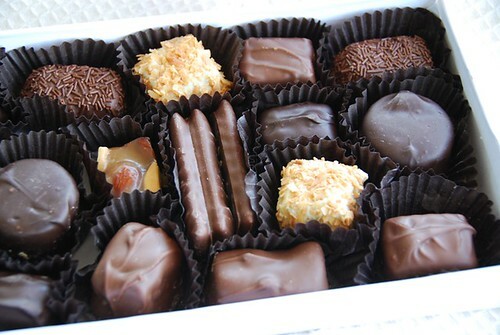 That is why I would like to try See's Candies. I was born in San Jose, CA and had See's Candy growing up. When my family moved up to Seattle 30 years ago I was devastated to find that they didn't have See's Candy, but shortly after that they opened a store.